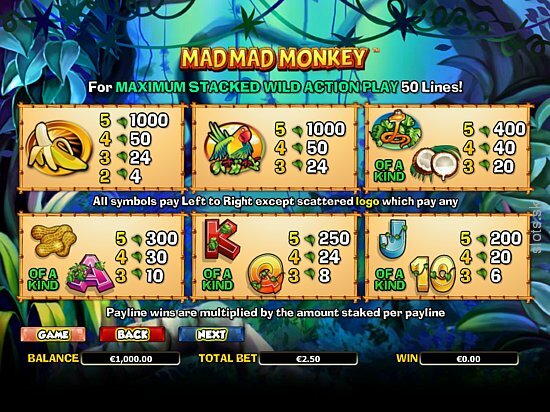 Swing from jungle vines with the mad, mad monkeys on their search for peanuts and bananas in this 5 reel slots online UK adventure. This 50 pay line game is accompanied by a handy pay table to help you tally your winnings. One of the more exciting aspects of this wonderful slot is that 10 free games are unlocked when you accumulate 3 or more scatter monkey symbols, leaving you with a hefty amount of chances to win some serious cash! NextGen Gaming is a premium online gaming provider that was first established back in 1999. NextGen prides itself on the new gameplay elements it has created for their online slot games and focuses on giving their players a more personal gaming experience. Since the dawn of the online casino slots games, this industry has gone through many changes, and NextGen is a developer which has embraced the new direction of online gambling. You can learn more about NextGen Gaming here. Their play-for-fun Facebook slot site has won awards for its quality, demonstrating this developer’s dedication to adaptability and versatility. Step into the crazy jungle and help Mad Mad Monkey, he is desperate to find his friends, and even more keen to find his favourite foods. His friends are always playing hide-and-seek with him, and if you help him to find his favourite foods and fruits he will gladly reward you for your time. 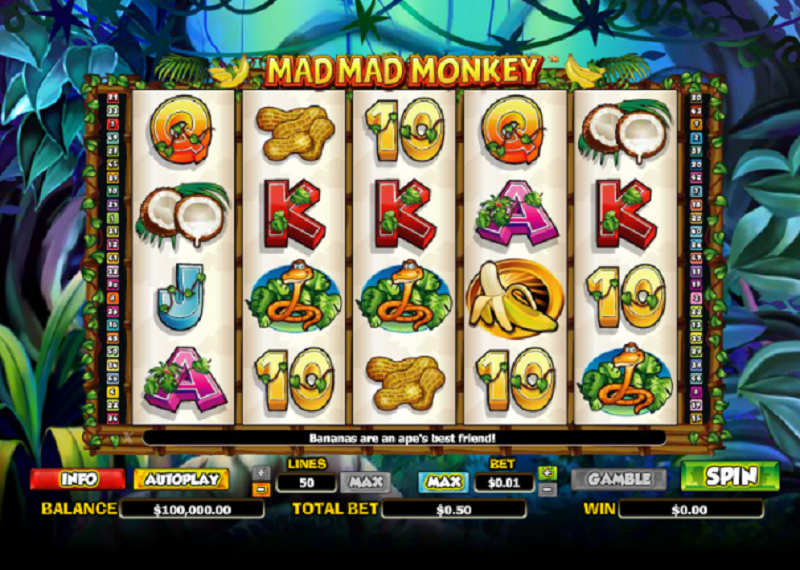 This fun, jungle-themed online slot game come with 5 reels and 50 adjustable pay lines. This fun game can be enjoyed by slot players of all levels and bank balances, you can spin for as little as 2p up to the maximum of £250 per spin. As soon as you start to spin, prizes and bonuses can be awarded to you. The game is set deep in the jungle, the background is full of dense green foliage. The reels themselves are decorated with vine-covered numbers and letters which are worth up to 300 coins when you find between 3 and 5 matching symbols. If you can find some of Mad Mad Monkey’s favourite foods he will give you even bigger rewards, for example, if you can find the Monkey Nuts symbols you could receive up to 300 coins, Coconuts are worth up to 400 coins, and Banana symbols will reward you up to 1, 000 coins. He will reward you too if you can find his friend's Snake and Parrot, rewarding you with 400 and 1, 000 coins respectively. The Wild Monkey symbol will substitute for all other symbols bar the Scatter, helping you to get even more cash prizes. When it forms part of a winning line your prize will be doubled! Wild Monkeys can also appear stacked, further increasing your chances of forming multiple winning combinations. 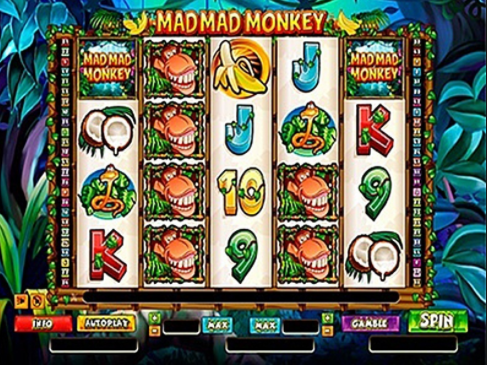 The Mad Monkey is the Scatter symbol in this fun-filled online slot. 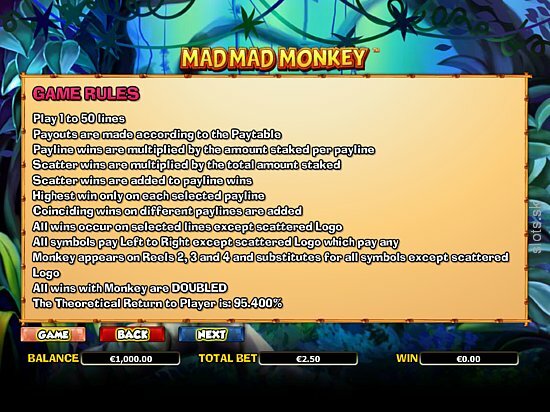 Scattered Mad Monkeys will multiply your total bet when you land 3 to 5 of them anywhere on the reels, the maximum multiplier is an impressive 400x! 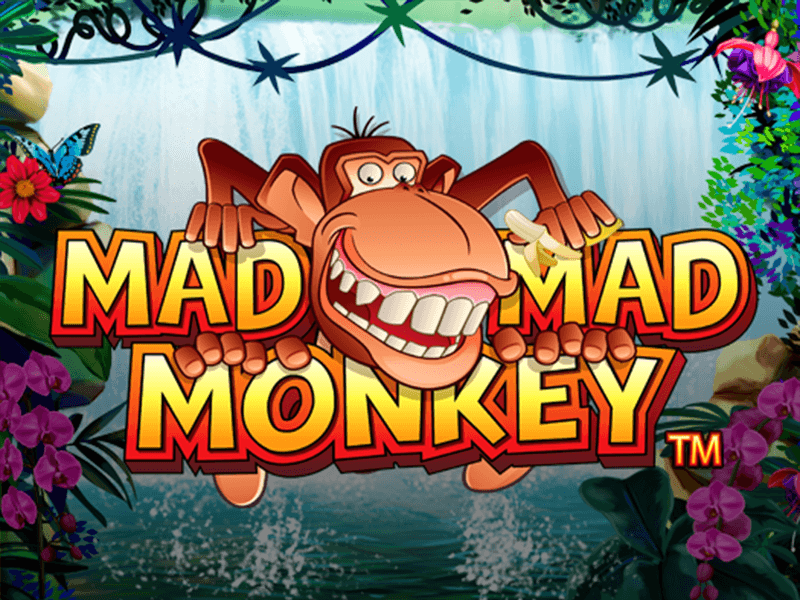 3 or more Scattered Mad Monkeys will also trigger the Free Spins bonus and you will receive 10 free games. During this Bonus round all Banana symbols will become Stacked Wilds and all prizes will be tripled, play today! This game is as mad as the title suggests, there are 350 possible line and line-bet combinations to be had in this online slot, NextGen has really gone all out with this one. What’s brilliant is that the staking options will allow slot players of all levels and budgets to get in on the action. This is a fun and entertaining game from the get-go, with a brilliantly designed jungle theme and loads of cash prizes to be won. If you enjoyed Mad Mad Monkey you might also like Fiddle Dee Dough online slots game or are you looking for more Easy slot games? If so, check our homepage.